Blue Raider outfielder Austin Dennis stands in the box to hit against Western Carolina on February 19th. Dennis was selected by the Houston Astros in the MLB Draft on Wednesday. Southern Miss (24-8, 10-1 C-USA) showed Saturday afternoon why they lead Conference-USA in eleven of the 21 batting statistics. Given Southern Miss’ red-hot offense, Middle Tennessee (14-17, 2-9 C-USA) knew an offensive outburst was required to upend the Golden Eagles. In the end, the Blue Raiders weren’t able to match Southern Miss’ offense, falling 9-5 in the second contest of the three-game weekend series. MTSU starting pitcher Tyler Troutt (L, 1-6) started strong by throwing two solid innings, but eventually gave up four runs in the third inning. Blue Raider freshman Drew Huff started a rally in the top of the fourth inning as he brought in Brad Jarreau from third base on a single into left field. But, the Golden Eagles countered in the next half inning, lighting up the scoreboard with another two runs in the fourth inning. Troutt was relieved mid-way through the fourth inning by Carson Lester, who provided a spark out of the bullpen and a chance for the Blue Raiders to make a comeback. Lester kept Southern Miss at bay during his 2.2 inning stint, allowing just three hits and one earned run while recording five strikeouts. With two runners on base and two outs in the fifth inning, MTSU’s Aaron Aucker doubled to center field, bringing home Jarreau and Riley Delgado. Huff came back moments later with a single to left field, driving in Aucker. He finished the day going 2-for-5 with two RBI. After a pair of hits in the eighth, Delgado’s ground out to shortstop allowed Blake Benefield to score, cutting the lead to 7-5. Delgado’s hot bat led the Blue Raiders once more, as he went 3-for-4 with an RBI and a run scored against the Golden Eagles. Southern Miss held off the MTSU comeback attempt by adding two more runs to extend its lead to 9-5, putting the game out of reach. 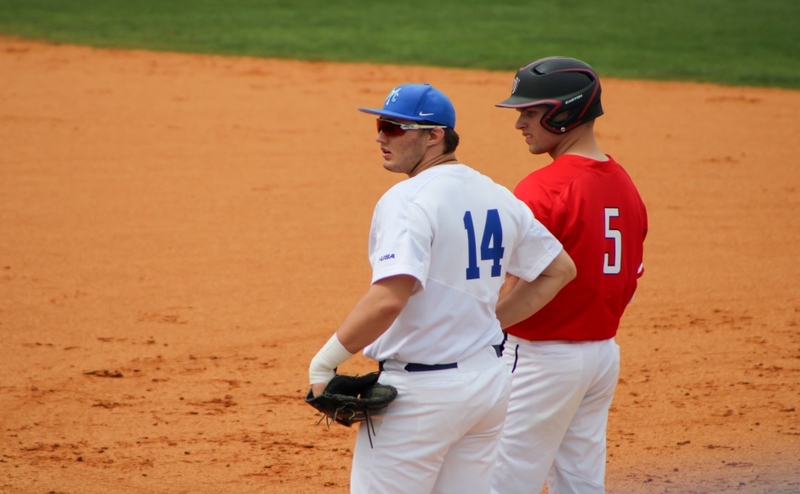 Hoping to avoid the sweep, the Blue Raiders will wrap up their three-game series against Southern Miss Sunday at 1 p.m. CT.
To contact Sports Editor Connor Grott, email sports@mtsusidelines.com or follow him on Twitter at @Connor_Grott.